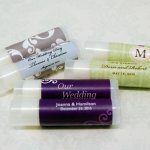 This marriage survival kit is a great engagement gift, wedding gift, or bridal shower gift. It is a thoughtful and economical gift that you can make yourself! I even provide a FREE Marriage Survival Kit Poster suitable for framing when you subscribe to my ezine. 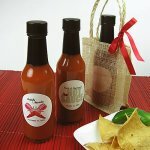 Hot Sauce: to keep things spicy. Mints: because you were "Mint to be Together!" ChapStick: to keep your lips kissable. "Wake me up with a kiss"
Matches: because you are "A Perfect Match". 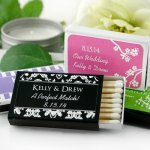 Order these "A Perfect Match" matches that can be personalized. 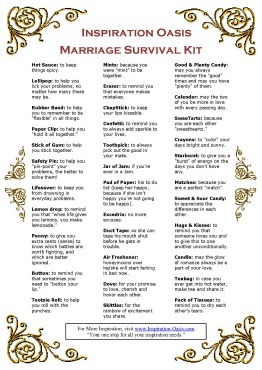 Hugs & Kisses: to remind you that someone loves you and to give this to one another unconditionally. Order this cute "XOXO" Hugs and Kisses Soap to remind the couple to keep the romance. Hershey's chocolate Hugs and Kisses can also be used. Lollipop: to help you lick your problems, no matter how many there may be. Rubber Band: to help you to remember to be "flexible" in all things. Paper Clip: to help you "hold it all together." Stick of Gum: to help you stick together. Safety Pin: to help you "pin-point" your problems, the better to solve them! Lifesaver: to keep you from drowning in everyday problems. Lemon drop: to remind you that "when life gives you lemons, you make lemonade." Penny: to give you extra cents (sense) to know which battles are worth fighting, and which are better ignored. Button: to remind you that sometimes you need to "button your lip." Tootsie Roll: to help you roll with the punches. Eraser: to remind you that everyone makes mistakes. Confetti: to remind you to always add sparkle to your lives. Toothpick: to always pick out the good in your mate. Jar of Jam: if you’re ever in a Jam. Pad of Paper: his to do list (keep her happy, because if she isn’t happy you’re not going to be happy). Duct Tape: so she can tape his mouth shut before he gets in trouble. Air Freshener: honeymoons over he/she will start farting in bed now. Dove: for your promise to love, cherish and honor each other. Skittles: for the rainbow of excitement you share. Good & Plenty Candy: may you always remember the "good" times and may you have "plenty" of them. Calendar: may the two of you be more in love with every passing day. SweeTarts: because you are each other "sweethearts." Crayons: to "color" your days bright and sunny. Starburst: to give you a "burst" of energy on the days you don’t have any. Sweet & Sour Candy: to appreciate the differences in each other. Candle: may the glow of romance always be a part of your love. Teabag: in case you ever get into hot water, make tea and share it. Pack of Tissues: to remind you to dry each other’s tears. I've provided this printable poster of the Marriage Survival Kit suitable for framing. It is yours FREE along with my entire collection of inspirational posters when you signup for my ezine. After you signup for the Inspiration Oasis Ezine, you will be emailed a link and password to gain access to print the Marriage Survival Kit or any of my other FREE inspirational posters online.